Come and enjoy our hospitality and explore the popular annual Armenian festivals held in Armenia and Nagorno-Karabakh. Join the crowds that have been coming to our festivals year after year. Participate in cultural and sport events, film screenings, special exhibits, delicious food offerings, folk music, dance, and other activities. Spend a leisurely day with your friends and family, viewing beautiful handcrafts, or idling through the exhibits, that capture the fascinating history of the Armenians. Try a delicious meal and have a great time while you are at it. Phoenix Tour Armenia is proud to be associated with those celebrations and will assist you in every step for you to be part of these exciting events! The Snowman Festival is a two-day event in the town of Jermuk in the Vayots Dzor Province, the wintertime haven of Armenia. At the Festival, visitors will have the opportunity to take part in a snow art competition, where participants unleash their creativity to build snowmen and other ice figures. The Festival also presents the local and Armenian folk music and dance performances. Since the Jermuk is also the heart of winter activities in Armenia, visitors can participate in snow-climbing, skiing, snowboarding, hiking to the Jermuk waterfall, and riding on the Jermuk ropeway. There are also some athletic competitions like the Winter Cup cycling competition and much more. Join Phoenix Tour for this year’s celebration of the International Jazz Day at the Cascade Complex in Yerevan. 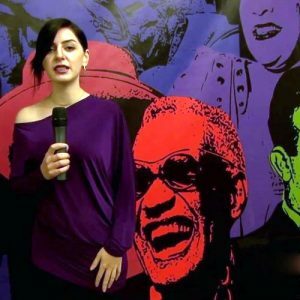 Yerevan Jazz Day brings together musicians and jazz groups from Armenia and across the world to celebrate jazz, and highlights its important role as a form of communication that transcends differences. The host company Eventtoura invites you to take part in the “Yerevan Wine Days” two day events. The program will be held on Saryan Street, where the representatives of the 15 most prominent Armenian wineries will offer their products, and the corresponding dishes with these wines will be offered by the renowned local restaurateurs. This is the annual festival celebrating dolma, the dish prepared by stuffing grape leaves and other veggies with a variety of ingredients. You will be exposed to a number of variations of the dish, for preparing dolma is peculiar to every region, each possessing its own flavor due to the use of a different set of spices and herbs. Traditional music, singing and dancing will set the mood for the festival. 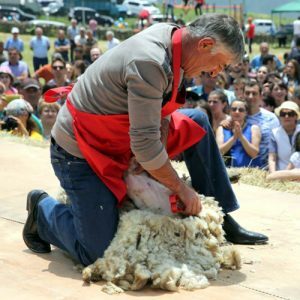 Strategic Development Agency NGO (SDA) in cooperation with IDeA Foundation organizes the annual “Sheep Shearing Festival”, which will be held at the Syunik Animal Market, next to the Khot rural settlement of the Tatev community in Syunik Province. The festival is primarily aimed to promote local products, traditions and culture of the Vayots Dzor and Syunik provinces, as well as to develop rural tourism, which will contribute to the economic development of both regions. 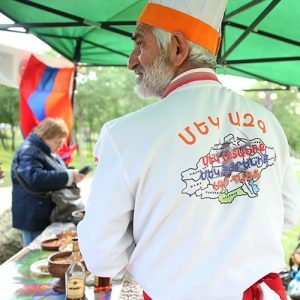 On June 15th, within the frames of the “Yerevan Summer” three month program, the festival of Armenian dishes the “Bread in the Mountains” will be held in Yerevan under the motto the “Yerevan with Flair”. The annual “Bread in the Mountains Festival” is a one day affair of celebrating the ritual and traditional holiday dishes of Armenians and other minority groups. Join the thousands of festival-goers to enjoy delicious food and live entertainment for all ages. Ask any Armenian – the herbs are essential to any meal. 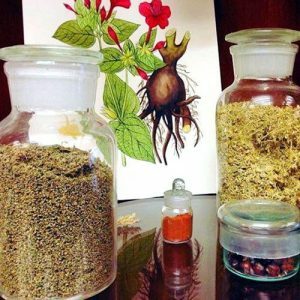 The HayBuis Festival, translated as “Armenian Herb,” celebrates these special ingredients and the traditional knowledge used to forage and prepare them. The Festival is held in one of the most picturesque places of Armenia – the Apaga Resort located in Yenokavan, Tavush Province, an area known for its beautiful forests and mountains. Visitors learn about Armenian herbs and different methods of using them, including their healing properties. There will be also an herbal tea party, educational games to learn about forest biodiversity, master cooking classes and other activities for children. And, if you are curious about what a 20-meter long lavash brduch (wrap) looks and tastes like, you can see and try it only at The HayBuis Festival! The Ecotourism Festival gathers eco-travelers from around the world to raise public awareness about ecotourism in a fun and adventurous way. Avid travelers and locals can expect an exhilarating combination of adventure and education, participating in morning yoga, trying local foods, taking in photo and art exhibitions about the RA Red Book plants and animals, participating in (or watching) a cycling competition, taking classes in mountain climbing, and the last, for the more adventurous types, camping under the stars. Children, adults, a group of artists and individual performers from Armenia and other countries are invited to participate in international festival held in Tsaghkadzor from 14 to 20 of July. The organizers of the festival are the municipality of Tsaghkadzor and the dance studio “Aygek”. The annual “Watermelon Festival” is held in the heart of Yerevan, at the Swan Lake. 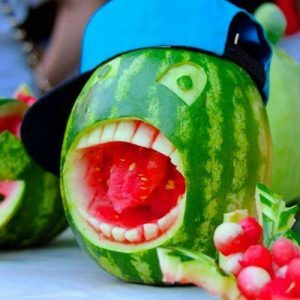 During the event, the watermelon carving specialists will demonstrate their skills and treat guests with juicy watermelons. The festival will be accompanied by live performances of the popular performers. The games and various competitions will be organized during the event, and the winners will be awarded by the Yerevan Municipality and its partner organizations. Yell Extreme Park is one of the most picturesque locations in Armenia, nestled in the forested hillsides of Yenokavan in Tavush Province. 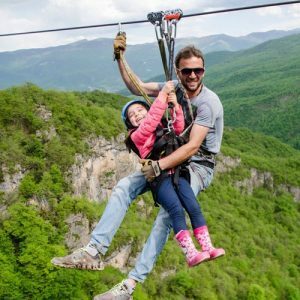 Visitors can experience activities like horseback riding, paragliding, mountain climbing, mountain biking, and the famous zipline at the Yell Extreme Park all year long. But the most exciting time to visit the Park is for its birthday celebration Festival, between experiencing the Park’s activities, visitors can enjoy music performances, cocktail and snack bars, and a night camping with friends around the bonfire, under the stars. The word “Vardavar” has two meanings: “The Flaming of the Rose” and “To Sprinkle with Water”. According to a legend, the goddess Astghik spread love through the Armenian land by sprinkling rosy water and presenting roses. The god Vahagn kept and protected that love, constantly fighting against the Evil. This Pagan feast was transformed after the adoption of Christianity: on “Vardavar” in modern times, everybody pours water on one another, starting early in the morning. 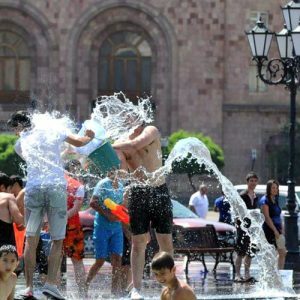 If you visit Armenia on this day, you should not feel displeased, or show you are offended, because it’s a long-preserved tradition that Armenians keep from generation to generation. The Honey & Berry Festival is a two-day event in Berd, dedicated to promoting agriculture, beekeeping, arts, crafts, and tourism. This sweet festival – literally and figuratively – is an excellent opportunity to enjoy Armenian nature, culture and agriculture all at the same time.The Festival opens with a jazz concert. Visitors can taste and buy local honey and berries in all their forms and types, admire and purchase handmade crafts. With trampolines and other games, this Festival is fun for the whole family. If you want to try a good barbecue, come to this festival. 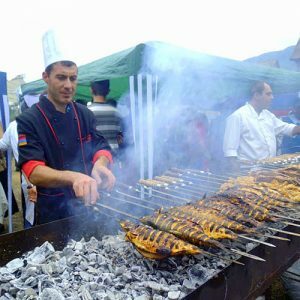 The delicious festival is devoted to one of the Armenian’s most appreciated dishes – khorovats (barbecue). During the festival you will learn all four ways of making a khorovats: “The Barbecue in the Fireplace”, “The Barbecue on the Horizontal Bar”, “The Barbecue in the Hole” (shepherd’s barbecue) and “The Barbecue in the Underground Oven” (tonir). 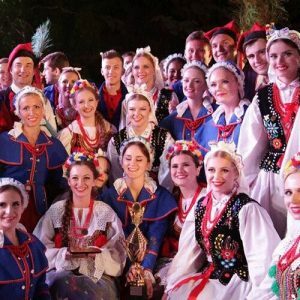 The festival will be accompanied by traditional songs, dance, games and theatrical performances. 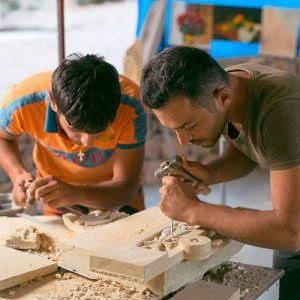 The Cultural Revival Arts & Crafts Festival held in Dilijan every year, promotes regional-specific arts and crafts, including decorative arts like pottery, blacksmithing, woodworking, and national cuisine. Visitors can also catch a glimpse of carpet-weaving techniques and view different types of Armenian carpets – some from museum collections brought out for open air display. Armenia and Karabakh are famous worldwide for their handmade carpets, and you can see a great variety of them during this annual festival. You will have a unique opportunity to purchase a piece of that craftsmanship, and place it in your house. Just pay a visit to a beautiful town of Dilijan, and choose a carpet, or a rug you like. Throughout the festival, groups perform songs, dances and play the traditional musical instruments of different communities from across Armenia. The “Gata Festival” is a one day affair of celebrating the traditional Armenian dessert gata. Gata is a pastry or sweet bread, and there are many variations of gata, and every town or a region will have their own version. It can be found in a variety of shapes, sizes and may be decorated or left unadorned. One popular variety is gata with khoriz, a filling that consists of flour, butter and sugar. Gata can have other fillings such as nuts, most commonly walnuts. Join the festival and enjoy the 2 meters long delicious gata and other traditional dishes, while you get entertained with traditional songs and folk dances. 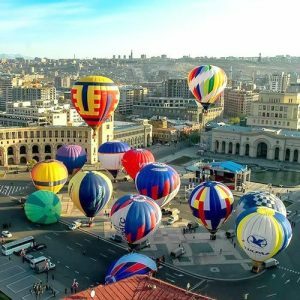 Balloons from different countries of the world will shine in the sky of the city of Yerevan, creating a fabulous and unforgettable experience for all present. The official opening of the festival will take place on the Republic Square. The primary aim of the festival is contributing to the growth of tourism, small aviation and aeronautics in Armenia. The Tea and Coffee Festival in Yerevan brings together all the tea and coffee lovers at Swan Lake – one of the most beautiful public spaces in Yerevan. Visitors stroll around the lake on a crisp autumn day, sampling both well known and new brands of teas and coffee. The wide selections of herbal, berries and fruit teas offer an opportunity to enjoy the flavorful produce of Armenia’s highlands long after the summer has gone. Visitors can sample and purchase tea and coffee while learning about their production. In the early morning all runners will gather in the Hamalir Complex area, have an energetic fitness warm-up, and get ready for the most exciting marathon. The thousands of runners will be doused from head to toe in absolutely harmless brights colors along the entire route, so you will not recognize yourself and your friends, when you guys hit the finish line! This is an entertaining marathon, so there will be no restrictions on the timing and rules. However, the first three men and three women will be awarded. The marathon will end with an incredible “Color Festival” party! The interest to the “Areni Wine Festival” grows each year involving more and more people, including both wine makers and wine lovers. It is also a great way to discover Armenia, its culture and traditions. During the “Areni Wine Festival” you can savor the best variety of Armenian wines that are highly valued by consumers worldwide. The opening starts with bright and spectacular parade of the best winemakers, accompanied with singing and dancing. 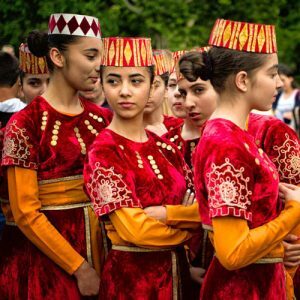 In the frame of this colorful festival there are games for all ages, Armenian folk and traditional music, dance and theatrical performances and, of course, a lot of wine! The ReAnimania’s goals are to facilitate the development of animation art, educate a new generation of world class animators and provide a forum for presenting works of Armenian animators in the international arena, as well as introduce examples of the world’s finest animated films to the Armenian audience. On November 30, the Armenian Apostolic Church will celebrate the “Feast of the Apostles St. Thaddeus and St. Bartholomew”. 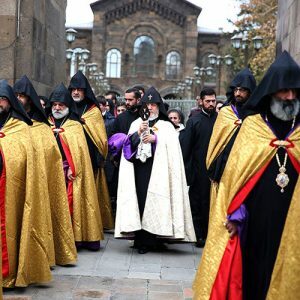 On this occasion the Holy Spear from Geghard will be taken to the Mother Cathedral in Echmiadzin, and during the celebration of the Divine Liturgy, the faithful will have the opportunity to kiss it and receive blessings from the Spear. The Holy Spear will remain on display in the Cathedral until late that evening.